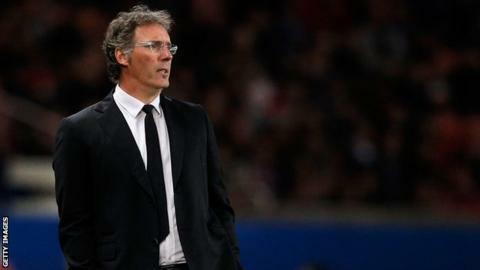 Paris St-Germain coach Laurent Blanc has signed a one-year contract extension which ties him to the French champions until 2016. Blanc, 48, led PSG to their second successive Ligue 1 title this week. "I am very happy to continue with Paris St-Germain," said the ex-France and Manchester United defender. "I want to be a part of this project over the long term, the most ambitious project in European football. Together, we will dream bigger." Blanc, previously in charge of Bordeaux and the French national team, was appointed as Carlo Ancelotti's replacement last summer when the Italian left to join Spanish giants Real Madrid. He guided the Qatari-backed club to the French League Cup last month, before they sealed Ligue 1 when nearest rivals Monaco failed to beat Guingamp on Wednesday. Last month, the Parisians were eliminated from the quarter-final stage of the Champions League as they were beaten by Chelsea. "It is perfectly justified to show our confidence in Laurent Blanc," said PSG president Nasser Al-Khelaifi. "We are very happy with his results this season, as well as the very attractive football the team has played. We are convinced we will win a lot more trophies together."